later received a scholarship to study cello. 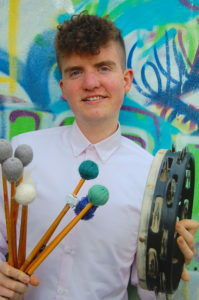 In his early teens, he began studying percussion at the RIAM and is currently a final year student of the BA in Music Performance Degree with Jonathan Herbert. Tadhg has taken part in many international workshops in the United States, United Kingdom, Columbia and Sweden. Some notable masterclasses include those with Evelyn Glennie (soloist), Chris Lamb (Principle Percussionist New York Philharmonic) Eriko Daimo (marimba soloist) and Thomas Kolor (Contemporary soloist). As a soloist, he has performed in various competitions including the Flax Trust Music Bursary and being a finalist in the Maura Dowdall Concerto. He has also played with orchestras such as Trinity Orchestra and in April Tadhg made his soloist debut with the RTÉ National Symphony Orchestra. In orchestral percussion Tadhg has freelanced with various orchestras and ensembles, including the RTÉ National Symphony Orchestra, RTÉ Concert Orchestra, and Aurora Symphony Orchestra (Sweden). As an avid chamber musician, he has performed in various locations around the world some of which were at New York University (USA), Aaron Copland School of Music (USA) and University of Valle (Colombia). He has won the RIAM Leo Gibney award for chamber music and silver medal at the ESB Feis Ceoil chamber group award. Recently he performed the World Premiere of an Irish commission by Evangelia Rigaki as a member of the RIAM Percussion Ensemble directed by Richard O’Donnell. Tadhg also has a keen interest in composing electronic music and enjoys collaborating it with live percussion in recitals and concerts.